Usa is a sixteen year old female who attends Yutakagikunshi Private Academy. She's good friends with everyone, especially Jimen. 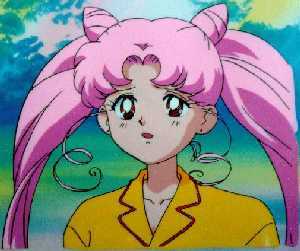 (Kaky gets a bit jealous of 'er for that... ^^;;) She looks like she did in that switch episode of BSSM when she and Usagi switched bodies. As Neo Moon, she's much more into fighting than her mother ever was (*BOL*). Usa says this to transform into Neo Sailormoon. She raises her brooch and pink and silver ribbons emit and form about her body in a heart shape. The bottom half of the heart folds up, through her legs and laying before her stomach. The top half folds down, through her head and arms and laying before her stomach, when they touch, they flash three times, once for arms, boots, and body. Then the silver ribbons swirl about her head and hips. In two flashes they form her tiara, triangle shaped odango covers, and earrings. Then her skirt. She does the same stance her mother did when she first transformed. This is Neo Sailormoon's defensive attack. Touching her tiara jewel she begins to glow with a silver aura. The silver aura seems to concentrate into her tiara and when it's finished her tiara is the only thing that glows. She removes it. Her tiara jewel and tiara glow now silver-pink. Then it forms a flat disk and she tosses it. It blinds and slices through the enemy. This is Neo Sailormoon's offensive attack. This is Neo Super Sailormoon's defensive attack. This is Neo Super Sailormoon's offensive attack.